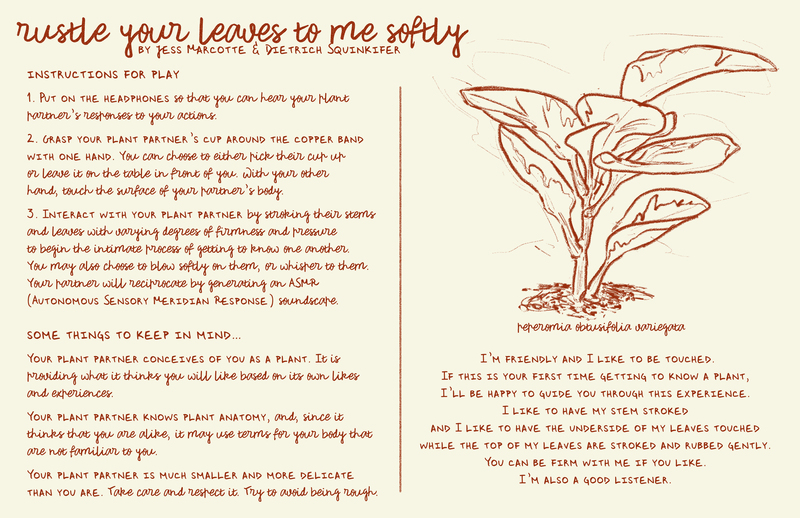 In rustle your leaves to me softly: an ASMR plant dating simulator, players form a relationship with one or more plants by touching and stroking them and listening to the ASMR soundscape feedback that is generated by their actions. The plant responds to the player’s touch by playing soothing sounds and plant-related words and poetry. Each plant has a different personality and preferences, determined by their physical properties, which players are invited to gently explore. rustle your leaves to me softly is an official selection of the 2018 Hexagram Campus exhibit at Ars Electronica, and will be showcased there from September 5th – 11th 2018 in Linz, Austria.